"Good morning, young Neopet," Naia the Fountain Faerie greeted Tivlia the Blumaroo. "Have you found the item I asked for?" "Certainly!" replied Tiv. "One Gypmu!" She placed the petpet in the palm of the faerie's hand. "I hope it doesn't bite." "It won't," stated Naia. "Gypmus are very timid." She set the petpet aside. "May I please have my reward?" asked Tiv. "Sure," answered Naia. "Which color would you like?" "Of course." Tiv stepped into the fountain and grinned as the wondrous waters swirled around her. Rainbows danced across her skin as it changed color. However, something wasn't quite right. When the process was over, Tiv was horrified to find that she had been painted Maractite, not Maraquan. "What gives?" Tiv blurted out. "I asked for Maraquan!" "Maraquan?" replied the astonished faerie. "I'm so sorry! I thought you said Maractite, not Maraquan!" "Could you please repaint me?" requested Tiv nervously. "I would, but the magic has run out!" frowned the faerie. She thought for a few seconds, then added, "Raincheck. Please come back tomorrow when the magic has been replenished, and I'll repaint you. I'm so sorry about this!" "Okay," replied Tiv. She left, somewhat disappointed. However, the problem wasn't devastating to her because she knew it could be fixed the following day. The next day, Tiv returned to the fountain excitedly. "Good morning, Tiv," the faerie greeted her. "I'd like to cash in on my raincheck," stated Tiv. "MARAQUAN, please." "I'm very sorry, but the fountain has been overrun by wraiths," frowned the faerie. "It's too dangerous to use it right now." "WRAITHS?!" yelled Tiv. "Feel my wrath, wraiths!" Tiv bolted toward the fountain in an attempt to deter the wraiths. "No!" gasped the faerie, restraining Tiv. "You'll get hurt!" Just then, a lavender-hued circle of light appeared next to Naia. Queen Fyora emerged from the outstanding orb, only to be confronted with the scuffle between Tiv and Naia. "Have some common sense, young Blumaroo!" ordered the Queen. "Wraiths are vicious creatures! You'll surely get yourself into trouble!" Tiv reluctantly stepped back. Then the Queen turned to Naia. "I can see that you need help with this wraith infestation. That's why you called me here." She hesitated. "This is difficult. I'll take care of the wraiths as soon as possible. They will probably be gone in a few days." "Thank you, your Highness," answered Naia as the Queen left. Naia turned to Tiv. "I'm so sorry, young Blumaroo," she sobbed. "I feel really guilty about your incorrect color, but now I can't fix it because the wraiths have arrived." Tiv sighed. "There's nothing you can do. Hopefully Queen Fyora will get rid of the wraiths soon." Every subsequent day, Tiv returned to the fountain, only to be confronted with the disgusting sight of the wraiths. "When is this problem going to be fixed?!" she whined. "It's been TWO WEEKS!" "I wish I could tell you," replied Naia. "I'll ask the Queen." Days and days passed, yet the wraiths continued to plague the once fantastic fountain. One day, Tiv arrived to hear Queen Fyora and Naia having a conversation. "Could you please fix this?" requested Naia. "It's been a month! The Neopets are disappointed, and wraiths are very threatening." "I've been very busy," frowned Fyora. "There was a robbery at the Hidden Tower, so I've spent the last few weeks trying to find the culprits." She disappered in an orb of light. "Your Highness—" blurted out Naia. Yet the Queen had already left. "This is ridiculous," growled Tiv. "I've been waiting for a month!" "I'm so sorry," answered Naia. "It's not your fault. The Queen is to blame." "I still feel guilty. I messed up your color." "However, I would've been repainted a long time ago if the Queen had just gotten rid of those ugly creatures." "I know. This is taking forever." Two months had passed. Convinced that the pests would never disappear, Tiv decided that she wanted to buy a Maraquan Paint Brush. However, she was appalled when she saw the price of the precious commodity. "I can't afford that!" she cried. She began to sulk in the corner. She continued to brood until she felt a hand on her shoulder. It was her sister Stepholla. "What's wrong?" she asked. "The Fountain Faerie messed up my color, and I can't afford a Maraquan Paint Brush," sighed Tiv. "I hear that there is this cavern in Maraqua where treasures lie, waiting to be discovered," pointed out Steph. "You could sell these rarities for millions of Neopoints. That way, you could buy a Maraquan Paint Brush. I'd go look, but I can't swim and dive. You're painted Maractite, so you can. How about it?" "I doubt I'll find anything, but at least it will be fun. Where is this place?" "Right here," answered Steph, showing Tiv a map. Tiv was swimming in the ocean, searching for Maraqua. She dove a few feet under the water and was promptly greeted by a mouthful of saltwater. "Yuck!" she grimaced, clamping her mouth shut. She eventually located Maraqua. After a few minutes of looking, she found the cavern. She swam inside and noticed that her surroundings were very dark. She wondered if she would be able to even see any potential treasures among the shadows. She swam around for an hour in search of luxurious loot. Then she realized that she had been swimming in circles the whole time. Discouraged, she was about to go home when she smacked her body right into the wall. "OWWWW!" she yelped. "I wish I could see!" As a result of the impact, the wall crumbled, revealing a newly discovered area. Rays of light were streaming down from the surface. Tiv swam forward and was stunned by the sight in front of her. There were piles and piles of treasure! Some items looked expensive while others didn't. She hastily stuffed the loot into her sack. She was about to leave when she noticed a large underwater castle. She curiously swam inside. There were a few cheap shells here and there, which she tossed into her sack. Once she had reached the core of the castle, she noticed a mannequin with a beautiful golden choker gracing its neck. She snatched the treasure and threw it into her sack. She returned to her sister with a giant grin on her face. "I'm guessing you found something?" stated Steph. "I found lots!" exclaimed Tivlia. "Wanna see?" "Of course!" The two sat down and examined the treasure. "These are cheap shells..." began Steph. Then her expression changed. "Here are some Maraquan Skeith Maractite Coins. These are worth 20,000 Neopoints each." "Great!" smiled Tiv. "However, that still won't pay for a Maraquan Paint Brush." "Well, let's keep looking." 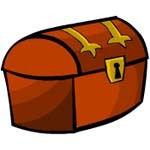 Steph was searching through the loot until she suddenly gasped. "Oh, my gosh. Look at this!" She held up the golden choker. "I'm guessing that's worth something?" asked Tiv. "Of course!" grinned Steph. "This is a Choker of the Deep! You could sell this for big money! Then you could buy a Maraquan Paint Brush and STILL have millions left over!" "Yup," smiled Steph. "Let's put this gem in the Auction House." The choker soon sold for millions of Neopoints. Tiv bought a Maraquan Paint Brush and took it to the Rainbow Pool in Neopia Central. "Stand still, and I'll paint you," stated Steph. Tiv stood in the water as her sister applied the posh paint. Then she swam in the pretty pool to make the pigment adhere. While the experience wasn't as fun as the Rainbow Fountain had been, she still enjoyed it. A few months later, Tiv and Steph were visiting Faerieland when they passed by the Rainbow Fountain. To Tiv's surprise, the wraiths had finally left. "They're gone!" Tiv cheered. "Yes," answered Naia. "The Queen got rid of them yesterday." "It took that long?" asked Tiv, rolling her eyes. "Yup," replied Naia. "There's a long line outside the fountain. 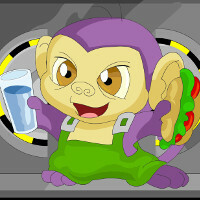 Tons of Neopets are cashing in on their rainchecks. 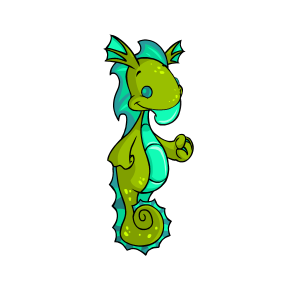 By the way, how did you become a Maraquan Neopet?" "I bought a paint brush." "Really? That must've been expensive. Yet I still owe you. Is there anything I can do?" "You could paint my sister." Steph grinned. "I'm tired of being yellow," she told the faerie. "Sure," answered Naia. "Which color?" Steph enjoyed the caress of the wonderful waves. The water swirled around her and adorned her skin with brilliant colors. Tiv and Steph left the fountain with huge grins on their faces. Wearing their beautiful hues, all they could do was smile.